If you’re looking for the latest and greatest minivan available then check out the 2018 Honda Odyssey. It not only offers all of the space and comfort that you’d expect from a van, but it’s also fun to drive and loaded with features. Available in five different trims with either a nine or ten-speed automatic transmission, you’re sure to find the perfect Odyssey for you and your passengers’ needs. The 2018 Honda Odyssey is the ultimate family minivan. It will comfortably hold up to eight passengers while keeping them safe and entertained on the whole trip. With it’s 3.5L V-6 engine and up to 28 MPG, the new Odyssey is perfect for both daily driving and long family road trips alike. This year’s redesigned model is the most powerful yet, with 32 more horsepower than its predecessor, making it fun to drive as well. On top of a spacious and versatile interior, this minivan also has all of the latest in Honda technology. Inside you’ll enjoy a 720P electrostatic touch-screen audio display, a rearview camera, Apple CarPlay, Android Auto, Bluetooth audio and HandsFreeLink, USB ports, an auxiliary jack and just about anything you need to keep the family connected. On top of that, available Honda Sensing adds a huge suite of safety and convenience features to not only help you drive safely, but whoever you pass the van down to one day as well. The base model of the 2018 Honda Odyssey comes with a wide variety of interior features. These include Push Button Start, Automatic Climate Control, a 7-speaker audio system with subwoofer, a 5-inch color LCD screen, two 12-volt power outlets, an SMS text function, USB Smartphone ports, an auxiliary jack input, and Bluetooth audio and HandsFreeLink. When you move up to the EX trim, you’ll be upgraded to Apple CarPlay and Android Auto, an 8-inch high-resolution touch-screen audio display system, SiriusXM & HD Radio, and HondaLink. Additional available upgrades include Multi-Zone Audio, an 11-speaker premium audio system with subwoofer, a rear entertainment system with a 10.2-inch screen and Blu-Ray player, a wireless phone charger, and much more. Don’t forget about Honda’s awesome in-cabin vacuum as well, or the available mobile hotspot capability, both included in the Touring and Elite trims. The features are almost endless in this minivan, so you’ll not only keep your family protected and comfortable, but fully entertained as well. There are also many awesome exterior features. Smart Entry allows you to unlock/lock your doors without taking the car key out of your pocket. This means that the doors will automatically lock themselves when you walk away as well. The available One-Touch Power Moonroof will allow you to get some extra airflow in your spacious cabin. A programmable power tailgate is available to make opening your truck a cinch, and hand-free settings are also available. All trims levels of the 2018 Honda Odyssey also feature a full security system as well as rear privacy glass. The 2018 Honda Odyssey has the best performance yet. With extra horsepower and a nine or ten-speed FWD automatic transmission, this vehicle provides wonderful acceleration and handling. This new model boasts 32 more horsepower than its predecessor, making it not only easy to drive, but fun as well. Despite its size, it offers responsive cornering, smooth shifting, and precise steering. Its capable suspension also handles bumpy roads with ease, great for keeping the back passengers asleep. On top of impressive performance, you’ll also get up to 28** MPG on the highway and 19 in the city, which is better than many of its competitors. The standard engine is a 3.5L V-6 with 280 horsepower and 262 lb-ft of torque. The new Odyssey comes standard with the latest in performance features including Active Noise Cancellation, Hill Start Assist, a Direct Ignition System, Intelligent Traction Management, Direct Fuel Injection, and more. The standard traction management system is great for snowy weather, as it offers an additional snow driving mode to help with driving on slippery surfaces. Remote Engine Start is also included in all trims except for the base model. High-quality, soft-touch materials and a great layout compose the comfortable 2018 Honda Odyssey. Seats are made of spill-resistant cloth or available leather. Heated front seats are standard on all trims except for the LX, and seat ventilation is standard on the Elite trim. This minivan has plenty of space for all passengers and their belongings with some of the highest cargo space in its class. You’ll never be wishing for more room in the new Odyssey. Even if the van’s full of adults, everyone will have a comfortable amount of head and legroom. Complete sets of LATCH child-seat connectors can be found in both the second and third rows. The driver and front passenger will be extremely comfortable as well. The driver’s seat is 8 or 12-way power adjustable with available two-position memory settings and the front passenger seat is 4-way power adjustable. With the Odyssey’s Magic Slide 2nd Row Seats, you can easily move them towards the center of the vehicle, providing better access to the third row and making it easier for the front passengers to reach back to the 2nd row. The 3rd row seats are One-Motion 60/40 split, making the seating options super versatile. There are also head restraints in all seating positions for added safety. The 2018 Honda Odyssey comes with a great assortment of safety features to make sure all eight passengers are fully protected. Standard active safety features include Vehicle Stability Assist with Traction Control, and Anti-Lock Braking System, Electronic Brake Distribution, Brake Assist, Daytime Running Lights, Tire Pressure Monitoring, and a Multi-Angle Rearview Camera. All Odysseys also include Advanced Front Airbags, SmartVent Front Side Airbags, Driver’s and Front Passenger’s Seat-Belt Reminders, and more. Honda Sensing is also available which adds features like Lane Keep Assist, Adaptive Cruise Control, Collision Mitigation, and Road Departure Mitigation. All 2018 Odysseys are also made of an Advanced Compatibility Engineering Body Structure with a Rollover Sensor, which means even in the event of an accident you’ll be well protected. 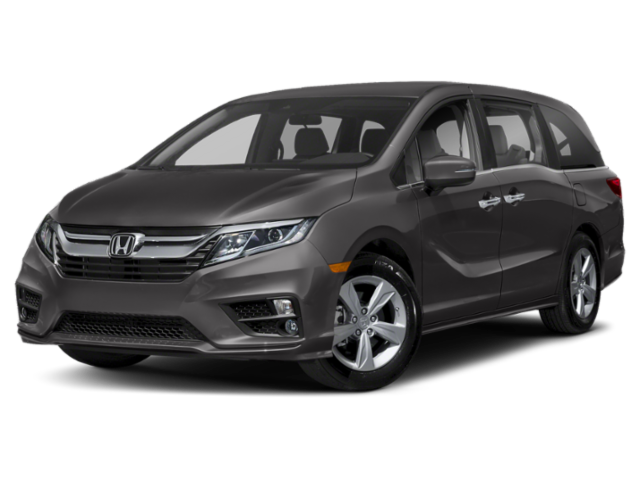 Whether you just want a minivan with a great set of standard features, one with every bell and whistle available, or something in between, there is a 2018 Honda Odyssey for you. The base LX model comes with a Multi-Angle Rearview Camera displayed on a a 5-inch LCD screen, a 160-Watt, 7 speaker audio system with subwoofer, two 12-volt power outlets, a remote entry system, and an 8-way power adjustable driver’s seat. If you upgrade to the EX, you’ll get Apple CarPlay, Android Auto, an 8-inch touch-screen audio display, Smart Entry w/ Walk Away locks, a blind spot information system, and Honda Sensing becomes available to add. The EX-L model adds leather-trimmed seats for extra comfort, a height adjustable power tailgate, and available navigation and rear entertainment systems. For even easier access to your tailgate, the Touring trim adds a Hands-Free power tailgate. It also adds on CabinWatch, which is a camera with night vision that will display on your touch screen so you can keep an easy eye on your back passengers. Front and Rear sensors are also added to make parking super simple. The Elite trim offers wireless phone charging, ventilated heated front seats, and 11-speaker premium audio system, and useful rain-sensing wipers. Need help choosing the right 2018 Honda Odyssey? *When you purchase a new 2018 Honda Odyssey at Buerkle Honda, you’ll be eligible for the Buerkle Rewards Plus program. When you become a member, your new vehicle will come with 5% back on service and parts, a 3-day, 300-mile exchange policy, 2 free oil changes, 2 free tire rotations, and much more! 160.1 - 163.6 cu. ft.
Come and see all of the great features that in 2018 Honda Odyssey has to offer in person. We have a great selection here for you to come and test drive. Bring the kids with you and see how much they love the comfortable back seats! If you have any questions about this awesome new minivan, our sales team will be happy to help you out. Remember that anyone who purchases a new Odyssey from us is eligible for the Buerkle Rewards Plus program. This means you’ll receive two free oil changes, free car washes, 5% back on service and parts purchases, and much more. We hope to see you soon! **19 city/28 highway/22 combined mpg rating for LX, EX, and EX-L models with 9-speed automatic transmission. 19 city/28 highway/22 combined mpg rating for Touring and Elite models with 10-speed automatic transmission. Based on 2018 EPA mileage ratings. Use for comparison purposes only. Your mileage will vary depending on how you drive and maintain your vehicle, driving conditions and other factors.